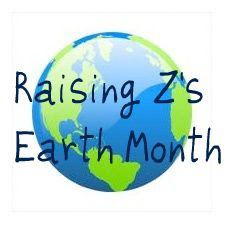 Earth Day is coming up soon (April 22nd for those of you who have not yet marked your calendars) and we at the Raising Z (and Lil' C) home feel that Earth Day should be every day :) Because of this, we have decided to make April, Earth Month. All month long we will be celebrating Mother Earth and hope that you will join the party. We have once again joined our CSA, our compost bin is on its way, our organic garden plans are in the works and we have started on a cloth diapering journey (yikes! )....we plan to share these stories as well as many more this month. I also have some fun goodies to give away (I am soooo excited about this). So flip off your Birkenstocks, run through the wet grass and give your favorite tree a big squeeze.....it is time to celebrate! What are your big plans for Earth Day??? I think I'll join you with a tree hug this month! We have started our seedlings inside, compose bin has been started as well. Where we have our garden has been turned over and irrated now if the weather will just warm up for good we can plant! Happy Earth Month!! Earth day is huge for me and I make a big deal about it in my classroom! I can't wait to see what you'll be posting about! we just got our first round of compost from last year's compost bin into the garden. it's beauty-full dirt. i tell ya. and the garden will be planted in the very near future. or at the very least ... the peas will be. and cloth diapering? i cannot wait until my little man fits into the cloth diapers i have. i've been struggling through disposables ... since i couldn't yet afford another set of cloth. if you are looking for an amazing cloth diaper mama ... i have just the one. let me know. her pocket diapers are specatcular! and she's an all around awesome lady. For Earth day we want to plant different plants around the backyard. Oh how wonderful! I look forward to reading about you month! :) We don't really have any big plans, other than just to get through the day, lol. Life is just so crazy right now it seems so hard to plan to do anything specific or special. What a great idea!! There is a movie coming out for Earth Day that we want to see and we will cook a healthy veggie meal. Can't wait ti see what else we can learn from you.